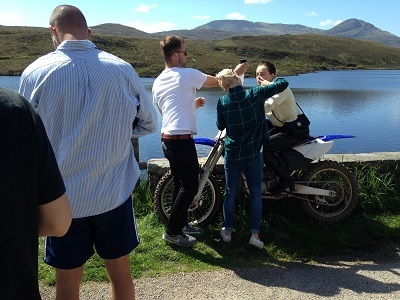 Vogue sped into Perthshire for a biker themed fashion shoot with 2013 model of the year Edie Campbell, model/pro skateboarder, Blondey McCoy and photographer Alasdair McLellan. The film locations were even named in the September 2016 edition of Vogue. Edie has graced two Vogue covers, modelled for Chanel and Hermes and is the 2016 face of Burberry. Alasdair, origjnally from Yorkshire, is one of the top fashion photographers in the world and a member of the Business of Fashion 500. His credits include Dior Joallerie's film and print campaigns, Louis Vuitton , Lucky Brand Jeans, H&M and Topshop. 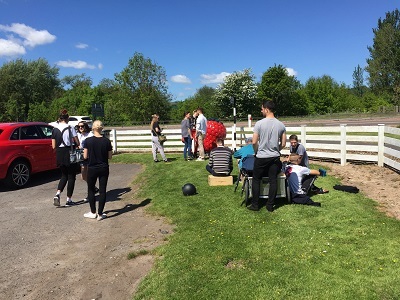 The shoot was organised by LS Productions including Amy Morement and Melissa Wyllie. Film location, The Horn near Errol just west of Dundee, started life in1960 selling fresh produce from the Farquharson family’s Horn Farm and has a life size model cow on the roof and is now managed by Julie and Kenny, son of the founders. 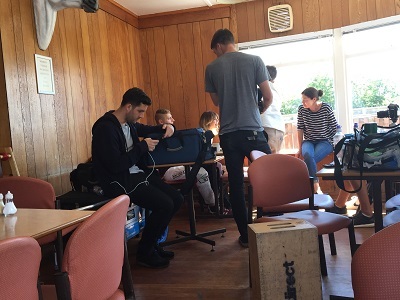 Behind the scenes pictures of the shoot at The Horn are courtesy of daughter Gabi Farquharson. 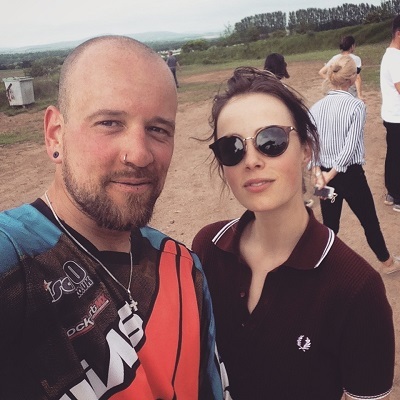 Next stop on the tour was another Perthshire filming location,, the Flockhart Motocross track at Coupar Angus and the expert hands of owner Stuart Flockhart. The shoot features Edie with ones of Stuart's own bikes, a Yamaha YZ250 and he was delighted to choreograph the bike shots. 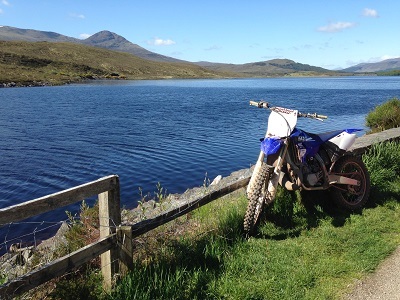 Stuart, a champion professional biker is a former Scottish Open champion and his team rides have included the Red Bull Freestyle MX UK Tour. In the feature, there's a picture with two bikers high in the air. He's the one in on the left with fellow rider Alex Kerr from Dundee on the right. If you're looking to get advice on biking or motor filming or photography, get in touch with Stuart. May the road always rise up to meet you (and all our lovely, film-crew friendly locations. 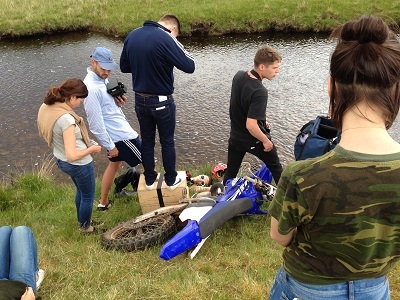 More behind the scenes pictures courtesy of Stuart Flockhart. For free help with your next project, please say hello and we'll help for free with locations for filming and photography, services and crew.